G’day and welcome to this Friday Afternoon at Dulwich Centre! We’re pleased to include here John Stillman’s presentation on narrative practice. Within this video John has tried to explain some of the key principles of narrative practice as if he was speaking to someone who was going to consult a narrative therapist for the first time. For those of you who are new to narrative ideas, we hope this presentation introduces you to some key narrative concepts. For those of you who are more experienced, we would be interested to hear what aspects of narrative therapy you might choose to emphasise to someone consulting a narrative therapist for the first time. Please join the discussion forum to let us know! Alice Morgan, (2000) What is narrative therapy? An easy-to-read introduction. Dulwich Centre Publications: Adelaide, South Australia. To read first two chapters online, click here. 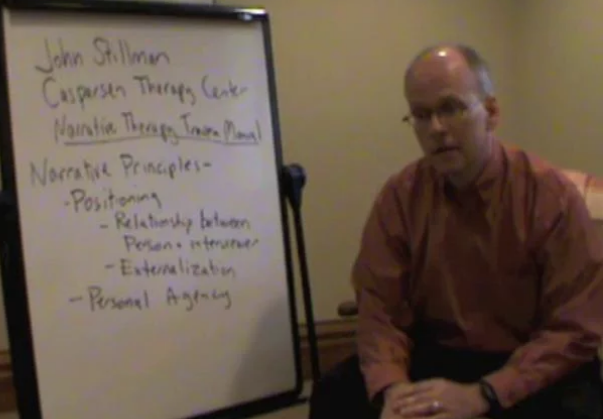 John Stillman (2010) Narrative Therapy Trauma Manual: A Principle-Based Approach. The thing I notice most in narrative conversations is the respectfulness. This is not only in sessions I’ve observed, and the times I’ve been privileged enough like you John to be interviewed, but also outside of the session. This is really important to me as a principle, and demonstrates narrative as a way of thinking, not just a work practice. I think externalisation is a key part of this respectfulness, as it brings a perspective that doesn’t encourage ‘blaming’ the person or family coming to see us. Telling someone about your situation could be pretty scary, and I guess fear of being judged or blamed could be part of this. I agree that externalisation increases a sense of personal agency. If the problem isn’t part of the person, but an external force trying to influence them, then choice becomes possible. This is very liberating – what a relief to sense that life doesn’t have to continue down the same path! After watching the video I’ll try to use the whiteboard more often, as I like the idea of slowing things down, and also in seeing the problem ‘out there’, and in supporting the person to more easily nominate the direction of the conversation. I’ve thought of this before, but often seem to forget, so thanks for the reminder. Thanks for your ideas, this is a really timely presentation for me. I was discussing with some colleagues the other night about why we might make narrative ideas explicit to those who speak with us and how we might make those ideas explicit. For some reason this issue becomes particularly apparent for me in the small part of my work that is private practice. Every time I say that I ask myself the question why should it be different in private practice? The only answer I can come up with is that there is an idea in some societies that the customer should know what they are getting before they pay for it. I can’t think of a good reason why somebody who isn’t paying for a service shouldn’t equally know what they are getting before they accept that service. As my sense of familiarity and comfort with narrative ideas grows I am finding I am taking more opportunities to explain to the people who see me the principles and ideas I am attempting to operate within. This might be in referral discussions, in-session discussions and especially in sharing documents. John, your ideas have inspired me to take an earlier and more direct approach to these explanations, so thank your for that. I will do my best to share some ideas at my first contact with people and also with referrers. The ideas of positioning and personal agency seem like very useful starting points. I wonder also about sharing ideas about questioning normalising jugdgements and their effects. Hello to all Forum participants. Thank you, John, for this description of the basic principles of Narrative Therapy. What stands out for me is the clear, transparent description to clients of our process and how we will guide discussion. This provides a “map” for the counselling sessions and explains in clear language the underlying principles behind the “magic” of externalizing practices. It will make a difference to me in the way I frame my initial interactions with clients. When I first was interviewed in a definitional ceremony, I did not fully understand how the process worked. I had been participating in training sessions but had not absorbed all the ideas. I was moved by the transformational power of the questions during my interview – it all seemed so mysterious and original. Was this mystery a good thing or a bad thing? I am thinking now that the interviewer tried to preface her questions with some of John’s explanatory priniciples. It just takes time and reflection to fully comprehend how Narrative Therapy proceeds. In fact, I have been told that it takes some years of training to feel comfortable with the concepts as a counsellor in training. I wonder how John’s introduction would be understood by someone who has no knowledge of Narrative Therapy or whether the introduction, presented all at once, would seem overwhelming and would dominate a session. I am curious, John. How do your clients respond to an orientation such as that provided in this video? Would you see this orientation being presented at a first session, or being portioned into discussion over a number of sessions. Thank you for your comments. In response to your question, I hold on to these principles as they inform the way I listen and the questions I ask. In the video I shared some of these principles and this can be helpful, especially with positioning and personal agency. I find it helpful for the person to know how I am positioned because a narrative conversation is often a different experience from what they are expecting. As for other principles, I am transparent about them as well, but introduce them at different times so as not to overwhelm nor to appear to have a structure that the interview follows. The beauty of a narrative conversation is to remain curious and centered on the person’s definitions of what they want and don’t want for their life. Other principles bring in ideas of intentionality, the influences of relationship and deconstruction of ideas and practices of society and culture. I also want to say a bit about your comment that narrative is mysterious. One of the reasons for writing my book, Narrative Therapy Trauma Manual: A Principle-Based Approach, was to take a bit of that mystery out of narrative while holding on to its beauty and creativity. I want people to experience narrative as something that they can start practicing tomorrow and grow with over a long period of time. I think that it is the responsibility of people who train to make narrative accessible. I have found that focusing initially on principles and then moving to specific practices provides a way to hold on to the ideas that inform narrative, and at the same time opens up the possibility of practicing narrative in many different ways. I am also conducting research on narrative and chose to focus on principles rather than practices so that narrative did not become a set of steps to follow. I am finding that this research using principles allows the use of narrative to be identified, and at the same time allows different therapists to use these principles in their practice in different ways. This has been an exciting development. Thanks for your comments. The idea of narrative as a developing practice is appealing to me. It has become a worldview for me, a framework no doubt like many others, because it corresponds with my ethical stance in life. I get better at the practical skills, but I am forever changed in the way I understand the world and how I communicate to everyone in it. A further point on our discussion of mystery and the importance of demystifying what we do: Casting intentions and thoughts in metaphor is a creative process, like that involved in writing poetry or producing a work of art. I think this process taps into something spiritual within us. There always will be some mystery attached to creativity. There lies the paradox. We are transparent hopefully, while our conversations are often generative and curiously original.